Who doesn't love shiny things? I certainly do. And when I can add "blindingly shiny" to any blog post, I am a happy camper. I've got the first taste of Fall from Octopus Party...and I am hungry for more. 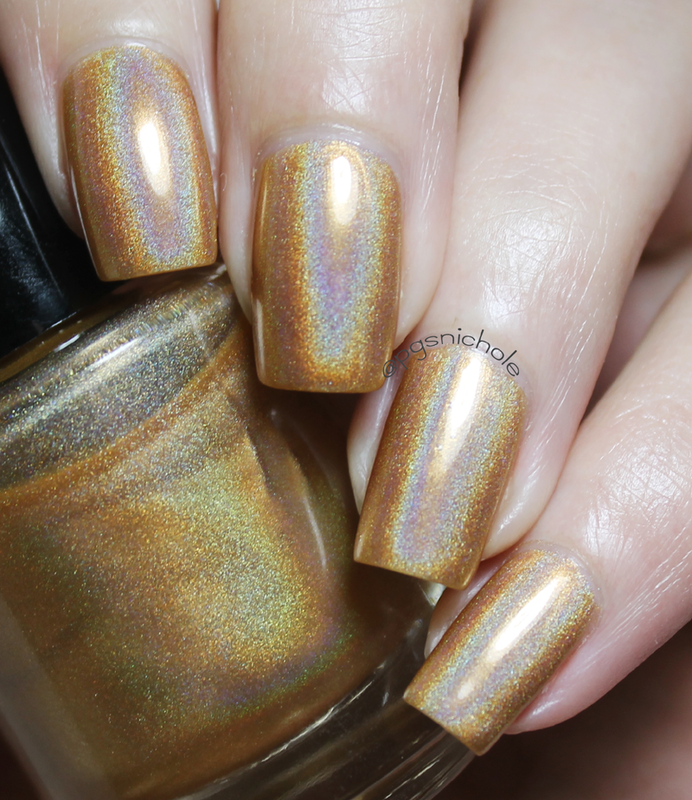 This one is a deliciously butterscotch gold holo. It applies fabulously in two thin coats (though I used three because I'm insane. It made no difference) and shines like a rainbow. While wearing this, I had the strongest craving for butterscotch ice cream...which no one else in my house likes. Savages. Indoors this reads a a pale, diffusely sparkling soft gold. This means it is actually pretty SFW. It's not until you shine a light (like the sun!) at it that it really starts singing to you. This is one of those colors that I definitely need to see on other skintones. It has the potential to be a great neutral from someone just a shade or two darker. Hell, it's a not-half-bad-neutral on me! Have you ever felt like "hmm, I just haven't blinded anyone with my nail polish lately..."? If so, here is your cure. This is the most sparkly thing I own...and that is saying something. 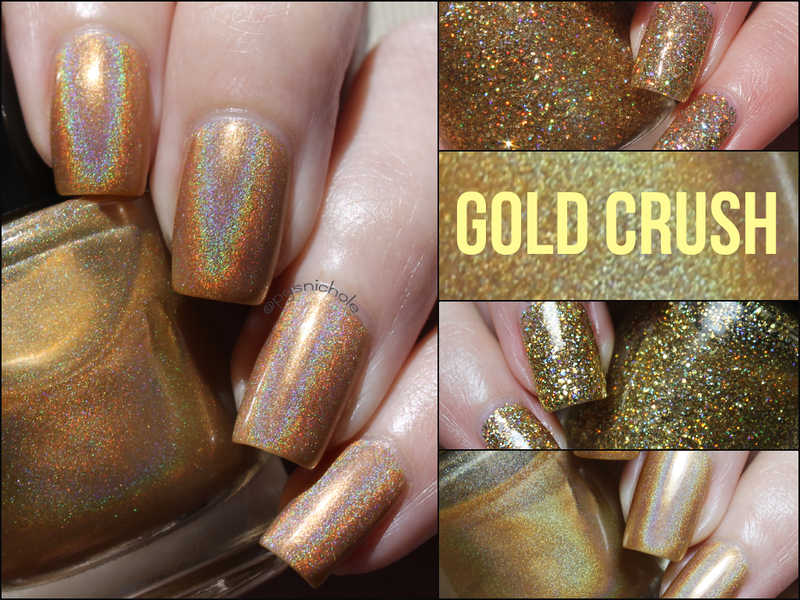 I actually have about 5 gold glitters, and usually I have to layer them all together to get a look like this. Which is pretty, but not at all wearable in reality. Thank goodness for Dave. What is fabulous about this polish is that you can wear it as one layer for a dense glitter-but not quite opaque look or do like I did below and use two-to-three layers for a completely covered glitterfest. I can't capture just how shiny this stuff is...and believe me I tried. in the sun. probably blinding a few pilots. So...I decided to try something new. On one hand, I am upset that it isn't in focus (apparently viewing an lcd in direct sunlight is harder than I anticipated)...but on the other, the slightly out-of-focus blur really lets the sparkly scream. Hooray for gifs...and husbands. My husband in particular, who made this gif for me after I cursed the size of the video. Glow for the Gold in the sunshine! And, for the very first time, Octopus Party is going to offer minis! You can actually pick this pair up in the full size or as a mini set. I think this would be a terrific Secret Santa gift, a stocking stuffer for your favorite polish fiend, or as a little "I didn't murder or beat anyone today" gift for yourself. They'll be available on Friday in his shop, so go check it out! Woah. That is fantastic. I must have it. you really must. 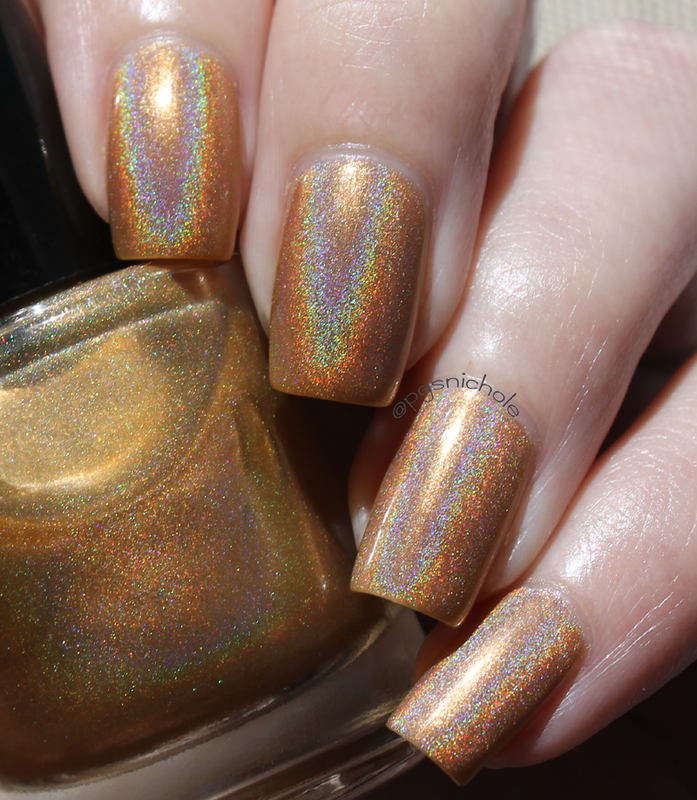 That gif is pretty much what the glitter looks like at all times, and the gold holo is practically a neutral. Wow! I love them both! I don't usually get excited about glitters but Glow is calling my name. he made minis of this set! You need it! Please don't post a link to your own blog *unless* you're linking to a related post (same/similar technique, theme, shade, etc). If you comment using your Google account, your blogspot blog can easily be found in your profile. If you want us to check out your blog, please contact us through email or on twitter. Spam, harassing comments, and those blatantly promoting blogs or websites will be deleted. It's 99¢ Sinful Colors Time Again! Bandelettes. Or How to Wear a Skirt and Not Cry.